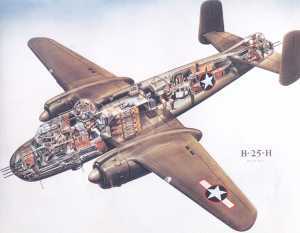 B-25H specs: top speed 275 MPH, one 75 mm cannon, 14 machine guns, max. bomb load 3,000 lbs. By Stephen Sherman, Aug. 2002. Updated January 21, 2012. On April 18, 1942, sixteen B-25B's leapt off the storm-swept decks of the carrier Hornet, 700 miles from their targets on the Japanese Home Islands. Still reeling from the devastating blow at Pearl Harbor four months earlier, Navy Captain Francis Low had hatched the plan to launch the USAAF twin-engine medium bombers at sea and have them land in China. Army Lt. Col. Jimmy Doolittle signed on to lead the raid. They determined that medium bombers could take off from aircraft carriers (just barely), but they could never land on them. Thus the planned landings at airfields in China. Doolittle recruited volunteers. (ed. I don't know if any of the volunteer fliers were handsome P-40 fighter pilots who had been at Pearl Harbor, as presented in that movie.) On February 3, 1942, they successfully test-launched B-25's from Hornet. To prepare the planes for the mission, they overloaded them with 1141 gallons of gasoline, removed the ventral turrets (more on that later), and stuck black-painted broomsticks in the tail as dummy guns (okay, they got that detail right in the film). On April 2, with 16 Mitchells on board, Hornet steamed from San Francisco, heading for a launch point in the North Pacific, 400 miles from Tokyo. But they met Japanese picket boats well outside of that range, and felt compelled to launch. Strictly speaking, in a material sense, the raid inflicted some minor damage on four Japanese cities: Tokyo, Kobe, Yokohama, and Nagoya. All the bombers were lost; eleven crews bailed out, four crash-landed, one was interned in the Soviet Union. Most of the fliers who were downed in China eluded the Japanese, and made their way back to the States. But the raid's impact on Japanese morale and planning was incalculable. Among other effects, the raid immediately stilled any opposition to the proposed Midway attack amongst senior Japanese military planners. And the destruction of four Japanese carriers at that battle marked the end of Japanese advances in the Pacific. The B-25 originated in a 1937 Army request for a twin-engine attack bomber that could out-perform existing single-engine types. Several companies submitted proposals; North American's NA-40 featured a crew of five, and narrow fuselage (made possible by unusual tandem seating of the pilot & co-pilot), shoulder-mounted wings, two Pratt & Whitney R-1830 radial engines, and provision for up to seven .30 caliber machine guns. (which grew to fourteen .50 calibers during the development of the B-25). The NA-40 didn't fly as fast as desired, so more powerful, 1600 hp Wright Cyclone R-2600 engines were installed in the next prototype, resulting in a top speed of 287 MPH. This prototype, the NA-40B crashed in April, 1939, and the Army selected the Douglas A-20 for the original attack bomber contract. But another requirement, put out in March of 1939, proved to fit North American's ideas. For this contract, they built the NA-62, a somewhat larger version, with a noticeably wider fuselage and side-by-side seating for the pilot & copilot. 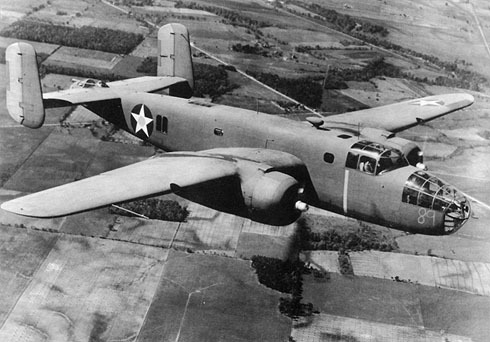 This aircraft won the competition for the 1939 medium bomber contract, and the Army ordered 184 planes, designated B-25; the first example accepted by the Army in February, 1941. Lee Atwood, a North American's chief engineer, suggested naming the B-25 for Billy Mitchell, which the Air Corps agreed to. Personally, I find it ironic that Billy Mitchell, the advocate of heavy bombers, was honored by an attack bomber - an aircraft type that, in many ways, was anathema to his concept of air power. As with all U.S. bombers in World War two, the development of the B-25 is marked by increasing armament, more armor, installation of self-sealing tanks, and, consequently, more weight. Until engines were correspondingly up-rated, performance inevitably suffered. Inadequate firepower in the nose and problems with gun turret installations, issues seen in many bombers, also challenged the Mitchell's designers. "The worst thing ever designed was the bottom turret of the B-25. It was the stupidest bit of equipment. My God, the operator is sitting in one place getting a reverse image through a mirror. He couldn't hit a thing. It slowed the damn plane down, and we weren't getting belly attacks anyway. What they really needed was a tail gun, which they eventually installed." Engines: Two 1700 hp Wright R-2600-9 Double Cyclone fourteen-cylinder air-cooled radials. Maximum Speed: 300 mph at 15,000 feet. Range: 2000 miles with 3000 pounds of bombs. Weight: 20,000 pounds empty, 28,460 pounds loaded, 31,000 pounds maximum. Armament: One nose-mounted .30 caliber machine gun. Four .50 calibers, a pair in two Bendix turrets (one top and one bottom). Between December, 1941 and May, 1943, North American turned out 1,619 B-25C's, the first large-scale production version of the Mitchell. The armament and the outward appearance of the "C" model closely resembled the "B." Changes included improved carburetors, a cabin heater, a larger (515 gallon) drop tank, a flame-dampening exhaust system, and underwing bomb racks. In the way of weaponry, the single .30 caliber in the nose was replaced by two .50's - one in the tip and one in the starboard side. An unusual character named Paul "Pappy" Gunn entered the B-25 story in the South Pacific, in the Fifth Air Force's Third Bomb Group. The relatively ancient Captain Gunn, 40 years old - thus the nickname "Pappy," a master of the American "can do" spirit, modified a number of aircraft for 5AF boss, General George Kenney. Gunn and his team transformed the B-25, tossing out the useless ventral ball turret, removed the bombardier position, and then added six forward-firing .50 caliber machine guns. The resulting power of these massed .50 caliber machine guns was awesome, and the 3rd BG's pilots used them to good effect, blasting away at Japanese barges and shore targets. A Zero caught by such a lead hailstorm simply exploded. The field-modified B-25 strafers made their debut at the Battle of the Bismarck. Their murderous effect on the Japanese soldiers on the heavy loaded troopships was terrible. World War Two was a tough proposition. For better or worse, both sides knew it was a fight for national survival, and they waged war accordingly. At the Bismarck Sea, the U.S. airplanes killed as many Japanese soldiers as they could. Then, when the barges sank, and the survivors leapt into the water or life-rafts, the B-25 and A-20 airmen machine-gunned them. Not very pretty. I guess the kind of war that we have more recently waged in Iraq and Afghanistan, where we answer to the U.N. for every stray bullet and every "collateral damage," is more humane. The "G" model featured a 75mm cannon in the nose, one of the largest weapons ever mounted in an airplane. After extensive testing at a secret base in California, the engineers made the idea work, but the B-25G was not very successful. While it could carry 21 rounds, aiming the big cannon was difficult, and it required a long "straight-in" run at the target. During this run, the aircraft was extremely vulnerable and could only get off four rounds. A number of B-25G's were modified by Pappy Gunn at the Townsville Australia Modification Depot, adding more machine guns and occasionally removing the 75mm cannon. Four machine guns across the middle of the nose. The 75mm cannon is partially hidden in a 'well' low in the nose. Four machine guns in side 'blisters' (only port-side pair visible). Two in top 'dorsal' turret. Two in waist positions (again only port-side shown). By late 1944, when the "H" appeared in the field, there were few targets that couldn't be attacked with .50 caliber machine guns, so the cannons were frequently removed. North American produced 1,000 B-25H's. 4,318 B-25J's were built (all at Kansas City between Dec. 1943 and Aug. 1945), the largest production run of any B-25 version. No more cannons, but with eighteen machine guns (as many 'J's were modified) it was a formidable strafer. Bomb Groups in the Mediterranean and the Pacific received their first B-25J's in mid to late 1944. Engines: Two 1700 hp Wright R-2600-13 Double Cyclone fourteen-cylinder air-cooled radials. Maximum Speed: 275 mph at 15,000 feet. Range: 1275 miles with 3200 pounds of bombs. Weight: 21,100 pounds empty, 33,000 pounds loaded, 41,800 pounds maximum overload. Strafer Version Armament: Eight nose-mounted .50 caliber machine guns. Four in side blisters. Two in top turret. Two in the waist. Two in the tail. In a complex, inter-service deal, the Navy (and Marine Corps) got some B-24 Liberators and B-25 Mitchells for patrol and anti-sub work. 706 Mitchells were assigned for use by the naval services; almost all of the PBJ-1's were flown by Marine Bomb Squadrons. Beginning in March 1944, seven of these VMS squadrons operated in teh Philippines, Saipa, Iwo Jima, and Okinawa. A few countries, notably China, France, Indonesia, and Brazil, operated Mitchells after the war. Unlike some WW2 types (P-51's and DC-3's), they did not see lengthy service anywhere, and were largely retired by the early 1950's. Some also served in the U.S. Air National Guard. North American converted a number to civilian uses - executive transports and fire-fighting aerial tankers. Many were used in the making of Catch-22, Joseph Heller's anti-war novel, made into a movie by Mike Nichols, in which Yossarian, General Dreedle, Colonel Cathcart, Major Major Major, Milo Minderbinder wage reluctant and crazy aerial warfare. "Save the bombardier." Nately's Whore's Kid Sister. "Take out the next man who moans and have him shot." North American B-25 Mitchell, by Jerry Scutts, featuring chapters on the plane's development, its use in the Pacific, by the RAF, over Burma, and in China. With a full appendix on all airplanes and crew participating in the Doolittle raid over Tokyo. Thirty Seconds over Tokyo (on VHS), the 1944 movie starring Van Johnson and Spencer Tracy, based on Captain Ted Lawson's book of the same name.